See progress of every student with live report and get finer detail per topic when you want it. We offer multi-language support for over 40 languages. And text-to speech for those with reading difficulties. You've been there before. The student 'says' they've practiced. But when it comes to test day they fail. 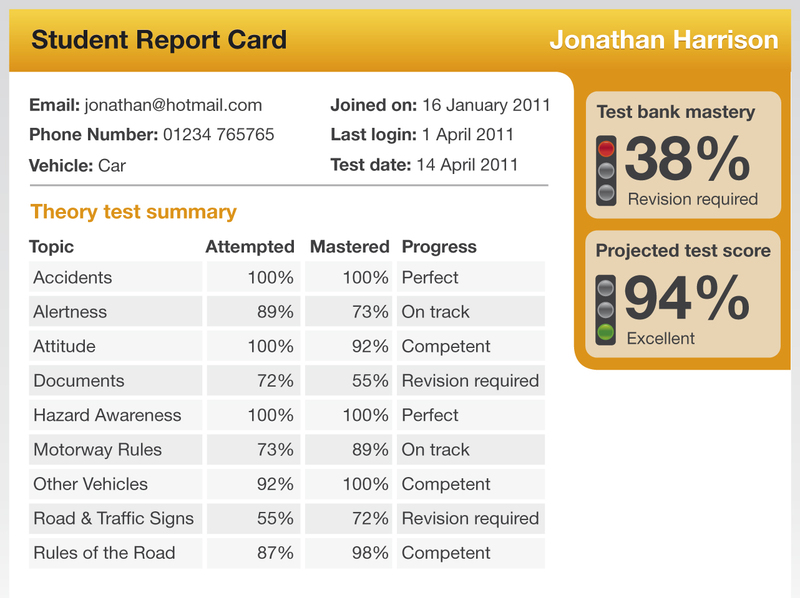 With Theory Test Pro you can see their real progress of each topic area on the test. So you'll know the facts. You can even nudge them in the software if they aren't up to speed. We measure their progress and success and work out a predicted test score so you know when they're ready. We're always up-to-date meaning you don't have to worry about regularly buying DVDs with the latest questions. Get a branded iPhone app. Your logo, our software. A match made in heaven. We put you at the forefront. The Robin to your Batman. Your students will learn theory in a more intuitive way. We adapt our tests based on their progress in their topics to make sure they don't just learn the questions and answers but can retain them. Making them better drivers.